We’ve been watching the War on Waste. Have you seen it? I was horrified to see that the average Aussie family throws out 1 tonne of food a year at a cost of $3,500. Wowzers! We rarely chuck food out and I think that’s because we’re enthusiastic eaters, we’re always hungry, we meal plan like bosses and I love upcycling what’s left and left overs. 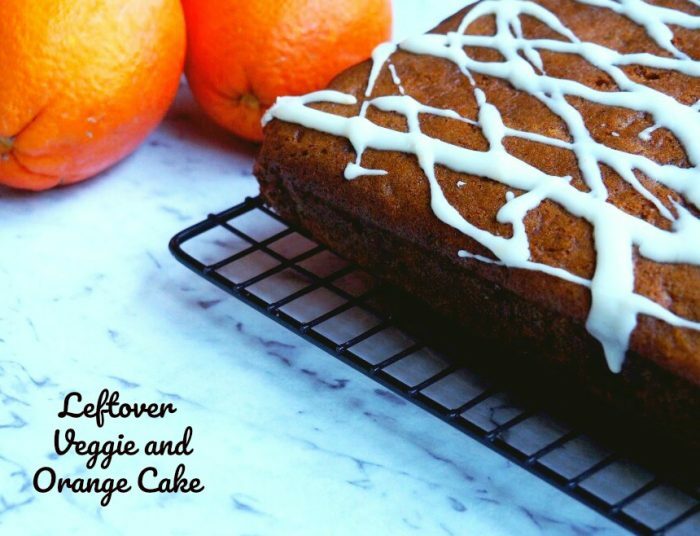 This cake is the perfect (and most delicious) way of upcycling any left over or tired looking veggies that you might have otherwise thrown away and one thing you can be sure of is that, everyone will want a serve of this fruit and veg deliciousness. I used pumpkin and carrots, but swedes and parsnips would work well too, just use whatever you have to hand. We’ve also been watching lots of health and food documentaries and are trying to cut back, not cut out, dairy. We’ve swapped cows milk for almond milk, but I have to say it’s taking a bit of getting used to! 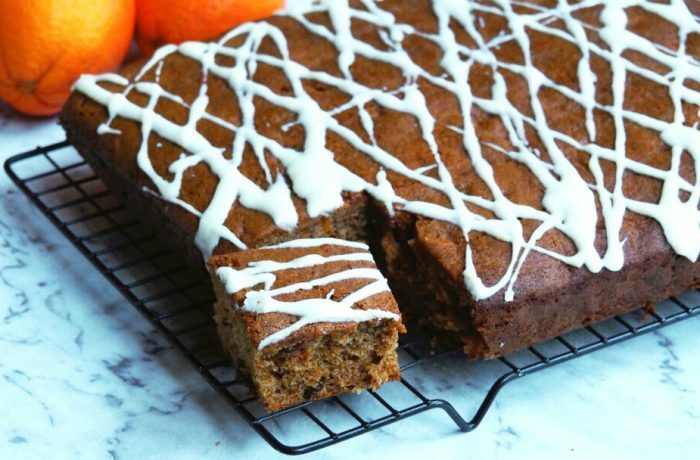 Using oil in this cake makes it dairy free (fist bump,) and gives it a fabulously light texture. It’s the business! I’m a bit obsessed with tray bake cakes because they can feed a crowd and they’re such crowd pleasers. 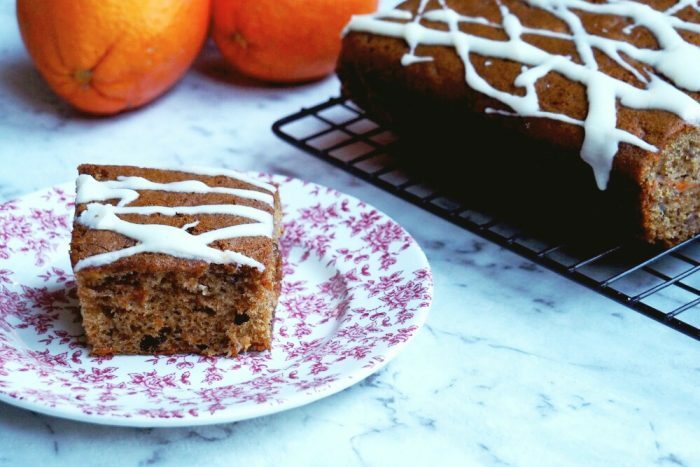 One thing you can be sure of, is that there definitely won’t be any leftovers and you won’t have to waste any of this cake, it’s totally addictive. So tell me, have you seen the War on Waste? Do you love left overs too? Mix the sultanas and zest and juice from 1 orange and microwave on high for 2 minutes. Set aside. Tip the sugar into a large mixing bowl and add the oil and the eggs. Mix gently with a wooden spoon. Then stir in the grated veggies and orange rind. Mix the flour, bicarb and spices and sift into the bowl. Lightly mix all the ingredients until the mixture has just come together. Don’t be tempted to over mix. Pour the mixture into the prepared tin and bake for 35-40 minutes or until it feels firm and springy when you press it in the centre. Leave the cake in the tin for 5 minutes before transferring to a wire rack to cool. To make the icing, sift the icing sugar into a bowl and stir in the remaining orange zest plus enough juice to make a runny icing. You want a consistency a bit like cream. Drizzle the icing back and forth in diagonal lines over the top letting it drip down the sides. Add spices, flour and bicarb to TM bowl and mix for 10 seconds on speed 6. Set aside. Place roughly chopped veggies into bowl and chop for 5 seconds on speed 5. Set aside in a separate bowl. Add eggs, sugar and oil in TM bowl. Mix for 5 seconds on speed 5. Add flour, bicarb and spice mixture and mix for 10 seconds on speed 5. Add veggies and raisins to the cake mixture and mix for 10 seconds on reverse speed 4 using the spatula to assist. Using a spatula, transfer the mixture into the prepared tin and smooth the top. Bake for 35-40 minutes or until it feels firm and springy when you press it in the centre. 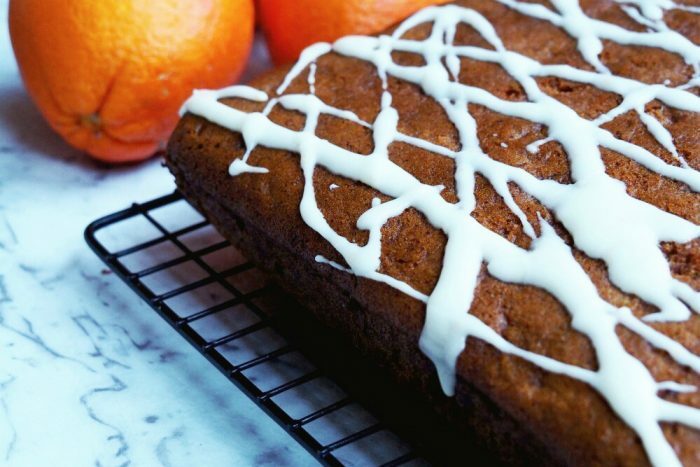 To make the icing: It’s super easy to simply mix the icing with a bowl and a spoon but if you are desperate to use the Thermomix, insert the butterfly and 1 tablespoon of orange juice and mix the icing sugar for 10 seconds on speed 4. You want a runny consistency, a bit like cream. If necessary, add more juice and mix for another 10 seconds on speed 4. Drizzle the icing back and forth in diagonal lines over the top letting it drip down the sides. TIP! The uniced cake freezes a treat. 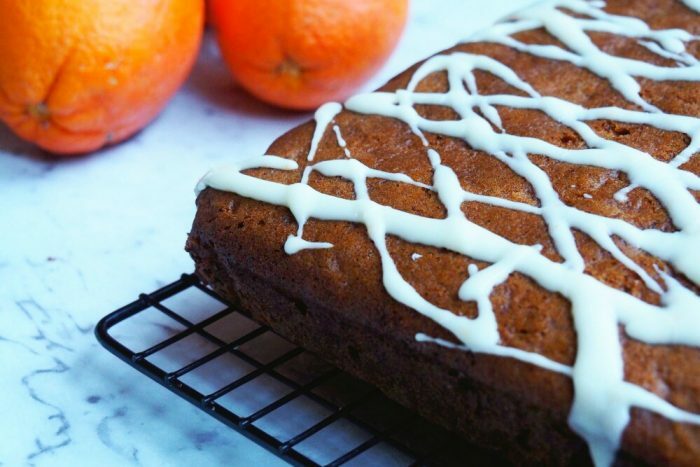 Veggies vary in water content, so keep an eye on the cake near the end of cooking – depending on what veg you use, the cake might take slightly more or less time to cook.